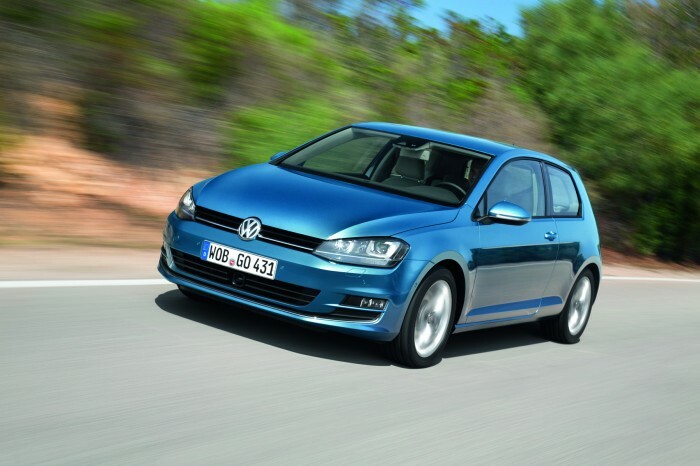 The Golf has been completely redesigned for the 2014 model year. The German automaker’s iconic hatchback now features smoother lines, new head and taillights, and is actually slightly longer and boasts more headroom. Despite undergoing a redesign, the 2014 Golf is still very recognizable as the successful sporty VW hatchback. New headlights with available LEDs heighten curb appeal, and the slightly longer 2014 Golf is sleeker than ever. The 2014 VW Golf is powered by a base 2.5-liter four-cylinder engine that generates a zippy 170 horsepower and 177 lb-ft of torque, but is the available diesel powertrain that is garnering most of the attention. Despite its impressive fuel economy, the Golf TDI (Intercooled Turbo Diesel) still generates 140 horsepower and an impressive 236 lb-ft of torque. The 2014 VW Golf’s standard four-cylinder engine returns 24 mpg city and 31 mpg highway. Drivers who opt for the 2014 Golf TDI will see those numbers improve to 30 mpg city and 42 mpg highway thanks to the revolutionary diesel powertrain. Enhancements in headroom have gone a long way to allowing the 2014 VW Golf to seat five comfortably, and the German automaker has ensured that occupants won’t be bored once they’re inside thanks to a slew premium available features, including a standard eight-speaker sound system, Bluetooth phone and audio streaming, navigation, iPod connectivity, and much more. The 2014 VW Golf boasts one of the most advanced airbag systems in its class, in addition to a number of other standard safety features, including stability and traction control, electronic brakeforce distribution, and a remote anti-theft system.